It was a cold and stormy night. JUST kidding! First, I went into the pantry to grab a bag of lentils. The bag wasn’t there. Hmph. I lugged out my “dry goods crate” which is basically an unorganized messy container filled with my grains, nuts and legumes. Tons of wheat berries, farro, rice, almonds, and 6-month old crushed pine nuts. Resigning to run downstairs to the market to replenish my lentils, I grumbled and pushed the crate back into its spot. I prepared my parsnip, which I got from the farmer’s market two weekends ago. Eh, I thought – it’ll be fine. Well, it wasn’t. I spiralized it and the noodles broke apart! What to do? 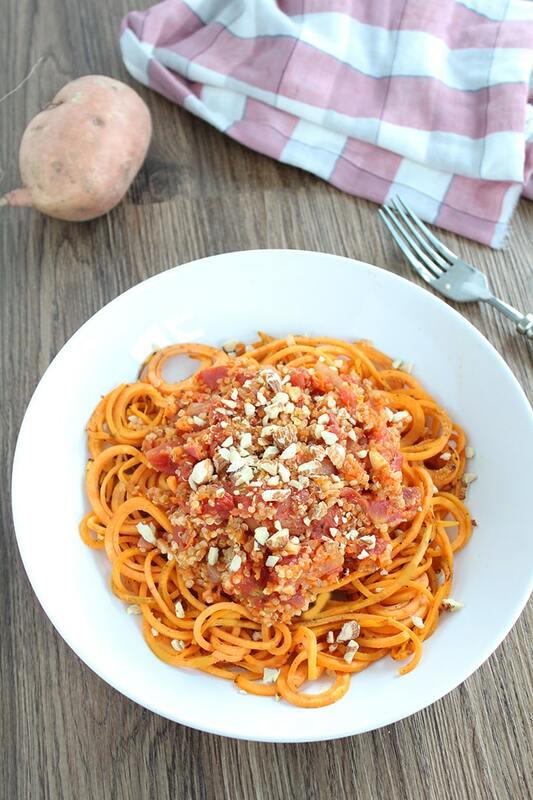 My second choice was always sweet potatoes, so I quickly spiralized one. So there ya go, that’s mah story!At the end of all of this, I’m thrilled that not only was I out of lentils, but that my parsnip wasn’t fresh enough to spiralize. Happy Monday, everyone. May your weeks be full of unplanned successes! Life’s funny sometimes, ain’t it? Place a small saucepan over high heat with the quinoa and water. Add a pinch of salt and bring to a boil and then lower heat and simmer until all water evaporates and quinoa is fluffy. Set aside in a bowl once done. As the quinoa is cooking, place your carrot and celery in a food processor and pulse until no large chunks remain. Set aside. Clean out the food processor and add in the almonds. Crush until chunky. Place a small skillet over medium heat and add in the crushed almonds. Cook for about 3 minutes or until almonds become fragrant. Set aside. Place a large saucepan over medium heat. Add in the olive oil and once it heats up, add in the garlic and cook for 1 minute. Add in the red pepper flakes, cook for 30 seconds, and then add in the celery-carrot mixture and red onions. Cook for about 3-4 minutes or until vegetables soften. Add the diced tomatoes, season with oregano and salt and pepper. Crush tomatoes using the back of a fork or potato masher. Cook for about 10-15 minutes or until sauce is mostly reduced. You want the sauce to be thick but still be juicy. 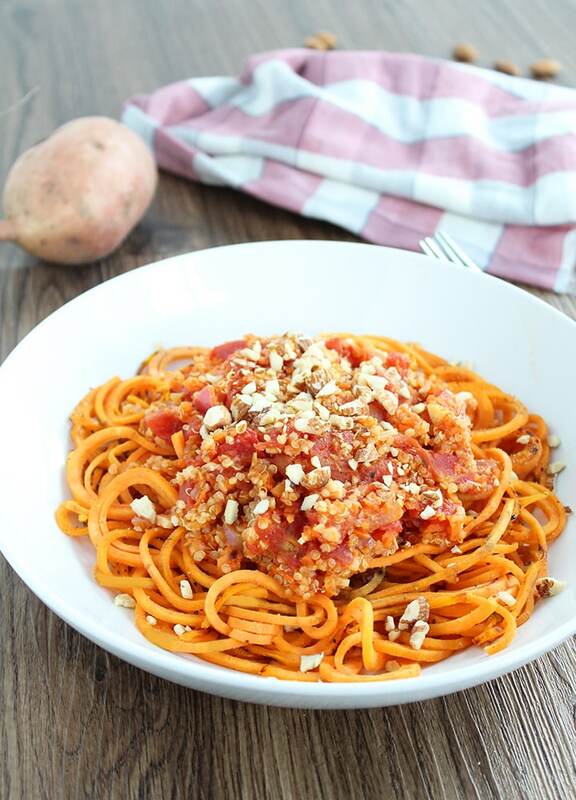 As the sauce is cooking, add the sweet potato noodles to a large skillet over medium heat. Lightly spray the noodles with cooking spray and season with salt, pepper and garlic powder. Toss frequently until noodles have wilted and softened, about 5-10 minutes. Once the sauce is done, add in the cooked quinoa and stir to combine. 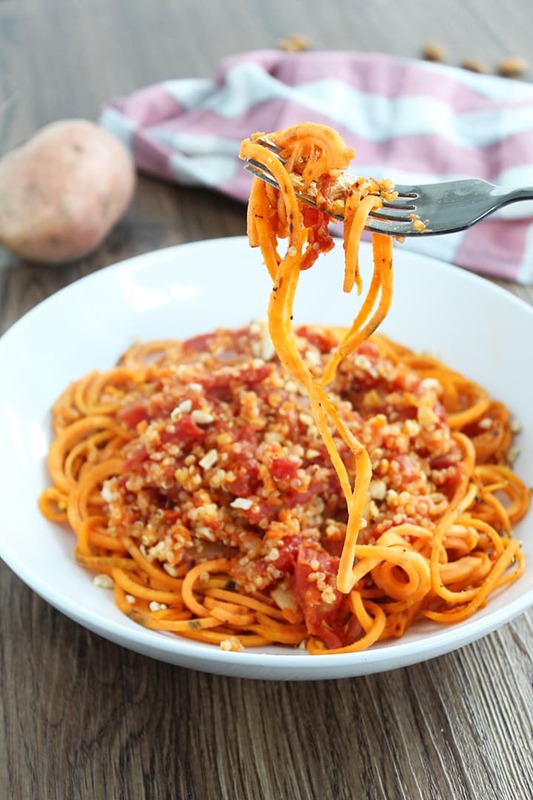 Add in the cooked sweet potato noodles and toss to combine. 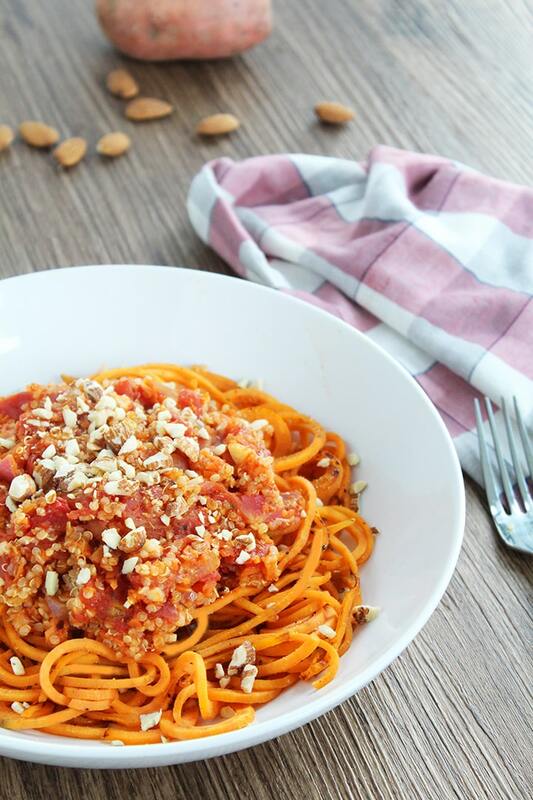 Plate the noodles into the bowls and top each with even amounts of toasted crushed almonds. Enjoy! That is pretty yummy looking unplanned success, looks like a delicious meal! YUM. This looks so filling yet healthy, I love it! 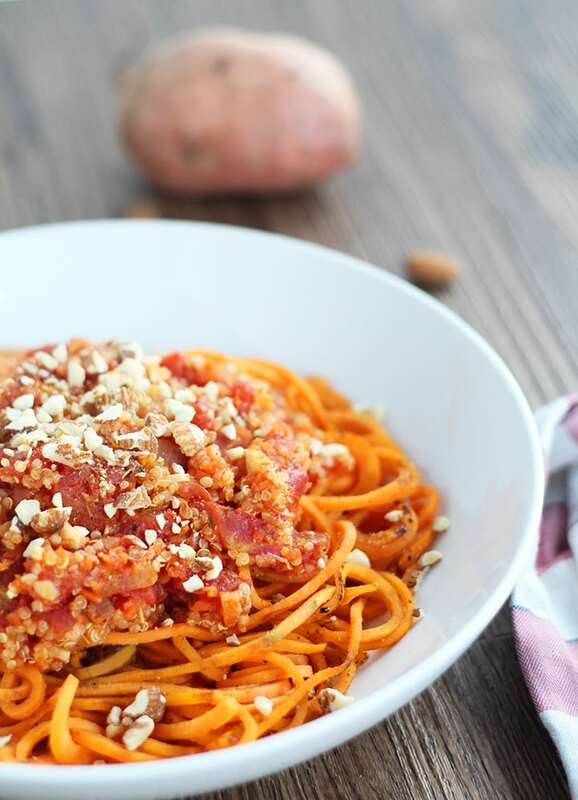 Could you use butternut squash noodles instead of sweet potato here? Yes of course, that would work nicely! 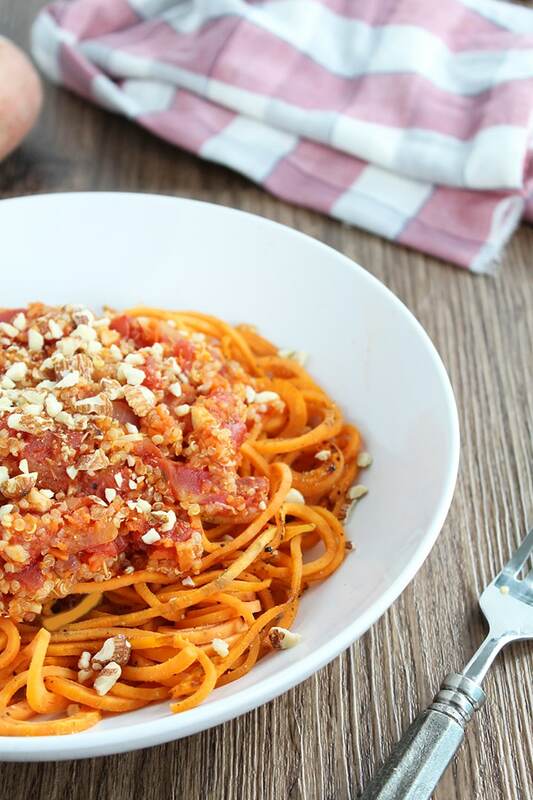 Thanks for featuring this recipe! Hope you liked it! Why do you italicize and bold random words in sentences? Your recipes look great but it's torture to read your posts. I've stopped using that style! My older posts still have that style, though! 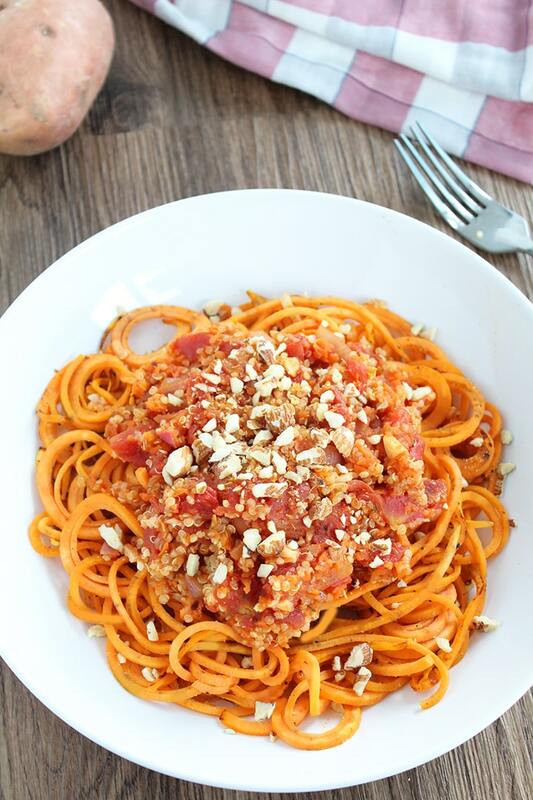 I stumbled upon this recipe and website while searching for spiralizer recipes. Boy am I happy I did!!! This dish was amazing. I'm still shocked by how cohesively these ingredients worked together. Seriously yummy and satisfying. Thank you for sharing it Ali. You have a new loyal and eager fan! Hi Lisa! A few of our earlier recipes do not contain nutritional information. We apologize for the inconvenience! 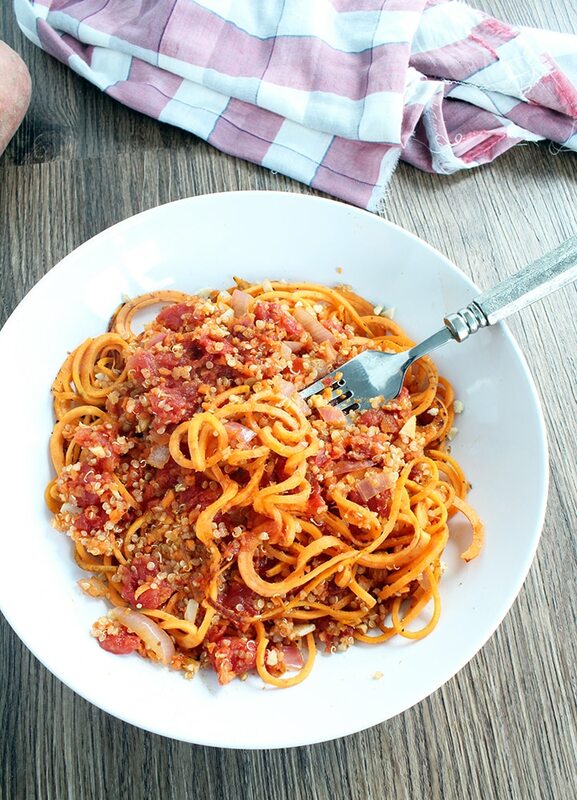 You use a lot of red pepper flakes in you recipes (which I love but I am struggling to find these in the UK.) Do you mean red pepper or red chilly flakes? I can only find chilly flakes and am wondering if they are the same? Ali: this recipe is a home run! OMG! I could not believe how wonderful all of the flavors and crunch from the toasted almonds all came together perfectly! You are a culinary genius! Even my meat loving hubs enjoyed it.